Here at NorthWest Locksmith Spokane we know security is a high priority when it comes to your business and keeping your assets safe. That is why we are here to assist you in keeping your business safe with top notch quality work and products! Our technicians are trained and certified in all areas of commercial locksmithing. Looking to increase your business’ security by installing a high secure lock? Need an emergency lock rekey service for security purposes? We got you covered! Any commercial job we do which include services and security product installations will meet your demand with the fire department marshal and state requirements. We serve many types of commercial customers which include but not limited to apartment complexes, property owners, schools, office buildings, stores, and many more! We provide services for a large variety of products and commercial locks from leading name brands like keyless entry lock systems, “panic bars”, and more! Exit Devices/Push Bars – When it comes to commercial properties, one of the most used type of security lock systems are push-bars also known as panic-bars. They are mostly used on emergency exit doors, or large two-doors entrances. Because of its type of use, it is important to constantly inspect the bar for proper operation, or replace it if an upgrade is desired. As a company with many years of experience in the field our technicians are fully trained and certified to provide the required maintenance, repair, or installation of such product. We offer many types of panic bars from different sizes that will fit many types of doors such as wood, metal, etc. 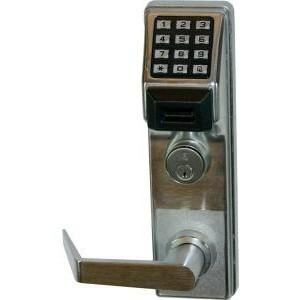 Electronic Keyless Entry Locks – In this day and age, the security of your business have an all new meaning. With today’s technology, leaving your business with those old mechanical simple locks could result in easier access for unwanted intruders to your business. On another aspect, what business didn’t have a problem with bitter employees who you had to lay off, but may still had access to your business? We have a solution for you! One of the latest technology products in commercial security that is very popular among businesses recently is an electronic access control keypad. The system is one big step in security level from the usual mechanical standard grade lock that you may still have installed for your business. Not only it will stand against unwanted intruders, you will not have to deal with keys ever again! The system have an independent memory that can contain up to 3000 unique users which can be added or removed when desired. We provide our commercial locksmith services in a fast and timely manner as we understand time is of the essence when it comes to your business. Your business is important to us and we strive in helping you resolve any locking issue you may have! The best part is, our technicians travel to you! Visit our coverage page to view our extended coverage in the area. Among other commercial services, we can do key duplication, and key make including Do-Not-Duplicate keys, master-key system implementation which include grand master-key and multi-user systems. At NorthWest Locksmith Spokane you can be confident you are top on our list and your company’s security is safe with us!